In 1997, Sony worked with Image Comics to publish a first-party Spawn video game on the original PlayStation: Spawn: The Eternal. The game was negatively received by both critics as well as fans and you would be hard pressed to find anyone who wishes it to be resurrected. Now, over twenty years later, Sony is once again trying a partnership with another major comic company, Marvel, to create a PlayStation exclusive Spider-Man game, which is something that hasn’t been seen since Sega published their own Spider-Man games in the early days of the Genesis. A product of long time collaborator Insomniac Games – who brought to life such classic franchises as Spyro the Dragon and Ratchet and Clank – Marvel’s Spider-Man can easily be likened to the quality of the Rocksteady developed Batman Arkham titles in terms of how well it adapts the title character to the interactive medium. With fast-paced, easy to grasp movement and combat systems and superb character work, Marvel’s Spider-Man is a game that deserves its place at the table with other first-party Sony published titles of this current generation. However a few pacing issues in its story and a unescapable sense of repetition in its side-content keep Marvel’s Spider-Man from being the character defining game it could have been. Taking place eight years into Spider-Man’s career, Marvel’s Spider-Man opens with the title character finally taking down his greatest foe: Wilson Fisk, a.k.a The Kingpin. Even with Fisk incarcerated though, there’s little time for Spider-Man to take in his victory as new threats begin to emerge that affect both Peter Parker and his alter ego as well as everyone he holds dear. Marvel’s Spider-Man starts strong but fails to keep that momentum going for the early portion of its campaign. Things do start to escalate towards the middle with a rather uncomfortable sequence that shifts the tone drastically, feeling less like Spider-Man and the game up to that point and more like something out of Christopher Nolan’s The Dark Knight. After this point a greater sense of urgency is added and the game finishes stronger than most other superhero game to date, but you’ll wish things were more evenly paced throughout or that the game itself was just a tad shorter. What gets you through those slower, meandering portions is your desire to see the story through to its conclusion, because for all its faults, Insomniac, their partners at Marvel, and phenomenal actors like Yuri Lowenthal, Laura Bailey and William Salyers among countless others make you care about these characters like you never have before in any Spider-Man game from the past. A lot has been said in the marketing leading up to this game’s release about the best Spider-Man stories being the ones where Peter and Spider-Man’s world collide, and that’s certainly the case here. 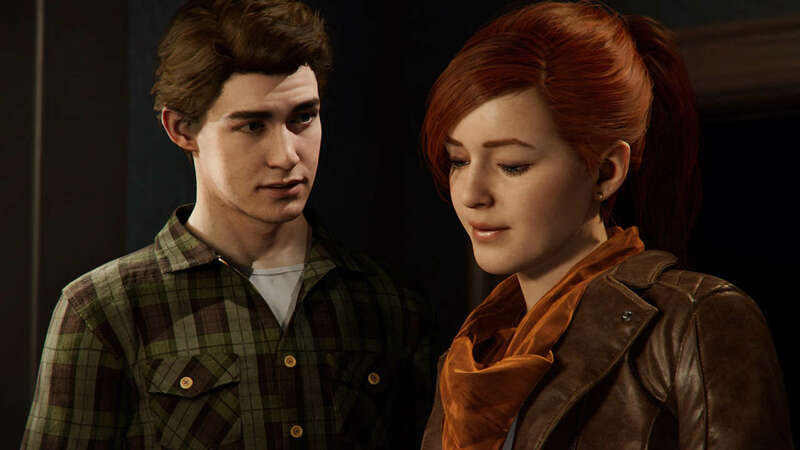 It’s telling that in a game where you get to web-swing around New York as Spider-Man that you’ll look forward to quieter moments where Peter will have a heart-to-heart with Aunt May or Mary Jane. If you’ve followed Spider-Man in any other media, whether that’s comics, films, animated series or other video games, you’ll have a good idea where certain plots will end up. Insomniac has taken the familiar and put their own spin on it though, making this game stand out in Spider-Man’s half-a-century legacy. Just because you may know what will happen to a character, what makes the inevitable end of their journey have a gut-punching – and sometimes tear inducing – impact is that you won’t want to see it happen because of how they’re developed throughout the course of the game. This is true for most of the cast, but unfortunately some characters, namely a large cast of the villains, hardly get any of the development that the main players in the story do. You understand what their motivations are and their past relationship to Spider-Man, but they’re present mostly to build spectacular set-pieces and fights around. 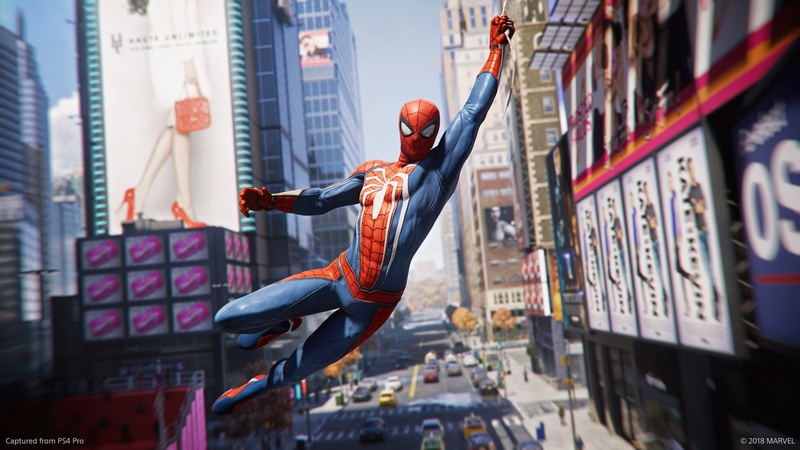 As refreshing as some of the story beats are in Marvel’s Spider-Man, its design is firmly rooted in past games like 2004’s Spider-Man 2 and 2008’s Spider-Man: Web of Shadows in that it’s an open-world, action-adventure where you get to web-swing around New York. Like the story though, Insomniac used their experience in crafting games like Ratchet and Clank and Sunset Overdrive to put their stamp on the character and have made arguably the most accessible Spider-Man simulator to date. To shoot a web, it’s as simple as pulling the R2 trigger and hitting the X button will either build height, speed, or help you web-zip to the closest building to anchor too. The city is also filled with easy to read areas in which to launch yourself from by simply squeezing the bottom two triggers together to further keep your movement flow going, and as you move deeper into the various skill tress, you can chain together tricks to both gather experience and show-off how cool you can make Spider-Man look. 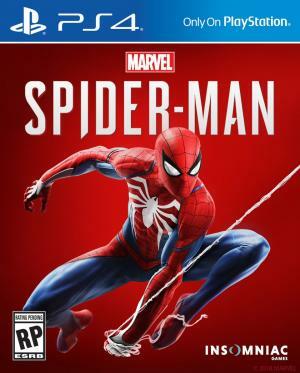 It’s an easy system to grasp and it makes Marvel’s Spider-Man a game that can be enjoyed by people who have spent over a decade playing other games of this type or for those who have never played a Spider-Man game before in their life. What’s not so easy to grasp, at least at first, are the combat mechanics in Marvel’s Spider-Man. Don’t feel ashamed in the least to lose a lot of opening encounters as you retrain your brain to stop thinking like how Batman handles in the Arkham games and start doing the things you’ve seen Spider-Man do in comics and other media. Once the combat clicks, it’s beyond satisfying as you launch enemies in the air, jump up to meet them, web-zip to an unsuspecting foe with the tap of a triangle button and then stick another to a wall with an impact web all in one encounter. Enemies come at Spider-Man with guns, weapons, shields, missile launchers and come in light and heavy varieties and you’re meant to keep Spider-Man in motion as much as possible to deal with these diverse set of threats. Similar to Insomniac’s Ratchet and Clank series, you’ll eventually start accumulating various tools that you can access via a weapon well like a web-bomb that can immobilize a large group of enemies for crowd control and electric webs that are imperative to use with tougher enemies deep into the game. 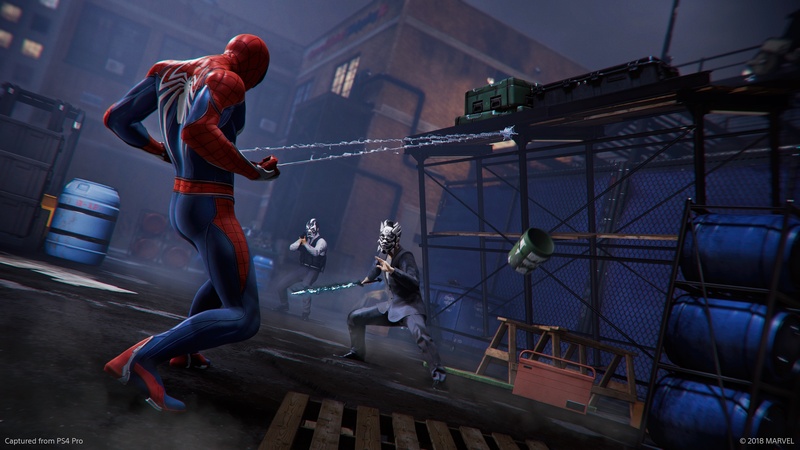 Environments are also littered with objects to be thrown, structures to drop on enemies and you can even get to the point where Spider-Man can even use enemy weapons and missiles against them. It’s important that Marvel’s Spider-Man’s combat mechanics encourage so much experimentation, making each enemy encounter unique as you’re going to be doing a lot of fighting in the over twenty hour campaign. Falling into the trap of nearly every game in the open-world genre, there’s a lot to occupy your time with in Marvel’s Spider-Man but not all side-activities are created equal. The early optional missions are the best in the game, tasking you with hunting down backpacks that reward you with further insight into this world and are a treat for longtime Spider-Man fans and photo opportunities that celebrate both the city of New York and the Marvel Universe at large. Peter will also check in on research stations on behalf of Harry Osborn that are accompanied with activities that put unique twists on your movement skills like having to traverse the world without web-swinging or avoiding lightning bolts. These all have great context and meaning in Spider-Man’s world, but such activities fall by the wayside and are instead replaced by numerous missions that are nothing more than waves upon waves of fights and they can greatly test your patience as the hours melt away. You’ll clear out criminals from districts in the same few mission types that usually boil down to a fight and similarly clear out bases that are populated with six consecutive waves of enemies that need to be taken out. This is tolerable when you do it once, but then more bases keep popping up and new types of criminals start pouring into districts and it not only gets tedious, but it also torpedoes the pace of the game. For bases you can take the stealth route to clear out enemies, but even if you quietly dispatch enemies in the first wave, you still have to contend with another five in all cases. Should this concept be carried over into future entries, hopefully the option will be given to players to complete a full base if the first wave is taken out without detecting anyone. Spider-Man isn’t the shadow stalking predator that Batman is, but there’s ample opportunity to take out unsuspecting foes that lack the ability to look up to look up above them. You don’t get to stretch your stealth muscles as much as your fighting prowess as Spider-Man, but when you do, it helps to break up the plethora of fights. Like combat, your gadgets play into stealth nicely as you lure enemies into web-mines that stick them to walls or other enemies. Where stealth mostly comes into play is when you’re playing as other characters like Mary Jane. These sections never get more complicated than push item to distract enemy and then move, but there’s a greater sense of danger present knowing that the character you’re controlling doesn’t have superpowers to help them if they get caught and they’re just as long as they need to be. The addition of gadgets and other unique scenarios also help these situations from getting too stale. Peter also spends some time out of costume, but mostly it’s just spent solving connect-the-pipe and line matching puzzles. Should you wish, you can even turn these off in the options menu. Costumes, gadgets and upgrades can be bought with currency earned from doing side-missions as each has their own corresponding type of currency. For example, landmark tokens are earned by taking photographs and base tokens are earned both by clearing bases. Alternate suits are a common thing in Spider-Man games, but once again Insomniac has put their own twist on this idea. Each costume has its own perk: the Spider-Punk suit can unleash a sonic blast attack and the vintage suit adds onomatopoeia to your attacks. The game allows you to play with whatever suit you want, and for purists who wish to stay with the suit that was created for this game, any costumes perk can be added to whatever suit you wish provided that costume is first unlocked. Additional perks can be added to Spider-Man as well, allowing you to be detected slower when trying to be quiet or absorbing more damage from bullets. Marvel’s Spider-Man is not a perfect game, and it certainly could use some of its fat trimmed or additional variety in its side-content. It gets far more right than it does wrong though, and while this game owes a lot to Spider-Man games that came before it mechanically, no other Spider-Man game marries the heart of the character with his high-flying antics quite like this one does. Like Spider-Man himself who always gets the upper hand in round two, there’s no doubt that Insomniac will iron out the problems of this still strong first effort for future outings that assuredly will come either this generation or the next. Flaws aside, this is a strong comeback for Spider-Man in the video game space and brings back that exciting, hopeful feeling for the future of Marvel’s console games like Spider-Man (2000) from Neversoft did on the original PlayStation.